Another new setter this week with Triple. Whether that is a he or a she or a they, is unknown at the moment, but he/she/they have a penchant for eightsome reels (8- or 9-letter entries around a central square) with Definition and Letter Mixture clues (DLMs). Personally, I don’t do this clue type very often, and I wasn’t too sure how I’d get on with them. Unlike Azed where the letter mixture begins at the beginning or ends at the end of a word, here they can start and end anywhere. Oh, and I forgot to mention, the mixture included an extra letter that would, in clue order, start an observation that was to be written under the grid. 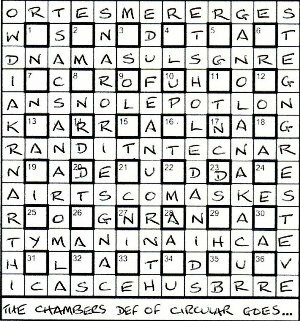 There were also eight normal clues with a letter omitted from the wordplay that had to be repeated in the central square, so a bit of relief here, except that we weren’t told which were the eight clues. These omitted letters would complete the observation. 4 was a strange clue: Cheque-chic adj Burberried, eg, in select drugget gave ULSTERED, despite ‘cheque-chic’ and ‘ulstered’ ‘Burberried’ not being words in Chambers (that I could see). Some clues were pretty easy, such as 32, with Whitaker (or Wisden) and the rest leading to ALMANACS fairly quickly. Others were a bit more tortuous, like 26 stilb n a unit of film actor’s gnathonic brilliance (with, I think, ‘stilb’ and ‘brilliance’ hinting at the type of unit we had to find). I managed to identify 9 and 14 as two of the ‘normal’ clues with a missing letter in the wordplay, and I guessed that 10, 17, 23, 28, 27 and 20 would form a symmetrical circle of the remaining six normal clues around the centre of the grid. This helped a bit, but filling the diagram proved to be a hard slog. I don’t mean that too derogatively, since the idea itself was pretty fair. Anyway, the message spelt out by the extra letters in the mixtures was The Chambers def of ‘circular’ goes, with ROUND AND (ROUND AND …) as the eight letters missing from the wordplay in the normal clues. The only disappointment was that I thought that this would turn out to be one of Chambers’s humourous definitions, like éclair and mullet, which I don’t think it is … or am I missing something? In summary, this was an entertaining puzzle from Triple, although, in my opinion, the result didn’t quite justify all the hard work! This entry was posted on 14 September 2012 at 4:00 pm	and is filed under Solving Blogs. You can follow any responses to this entry through the RSS 2.0 feed. You can leave a response, or trackback from your own site. “Ulstered” is in the 2003 Chambers (in the “Ulster” entry.